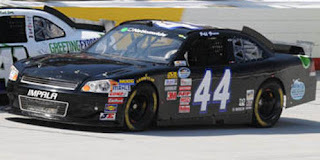 Jeff Green picked up the 20th last-place finish of his NASCAR Nationwide Series career in Friday’s Subway Jalapeno 250 at the Daytona International Speedway when his #44 East Central Florida View / HURT Chevrolet fell out with a vibration after 3 of the race’s 100 laps. Green now has 23 last-place finishes across NASCAR’s top-three divisions, tying him with Dave Blaney for fifth-most all-time. He remains second in the Nationwide Series standings, four finishes behind all-time series leader Jeff Fuller’s mark of 24. Green qualified 28th for the race at a speed of 176.374 mph, besting five “go-or-go-homers” including Chase Miller, whose Key Motorsports #46 was the only team that failed to qualify. Soon after the green flag dropped, Green pulled behind the wall along with Fontana last-placer Mike Harmon and his #74. Harmon held 43rd for much of the race, but returned to the track in the closing stages to complete a total of 29 laps. This shuffled Harmon up to 41st, moving Green down to last and Carl Long to 42nd. *This is Green’s first-ever last-place finish in a Nationwide Series race at Daytona. *The #44 had never before finished last in a Nationwide Series race at Daytona. The finish in Saturday’s race moved Green back into the 2011 LASTCAR Nationwide Series lead, breaking a tie with Brett Rowe, who came home last in the previous race at Road America.